2. In a small bowl, combine the pumpkin, maple syrup, cider vinegar, spices. Warm in microwave. Mix well. 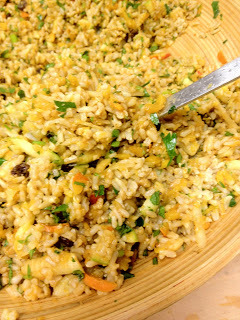 Add this mixture to the warm brown rice. Fold until well distributed. 3. Prep your apples and onions by dicing. 4. 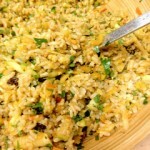 Fold into the rice mixture: raisins, apples, onions, walnuts, olive oil, parsley flakes and salt to taste. Top with optional warmed chickpeas. Serve warm or keep in warm oven until ready to serve. But do not over-heat. You want the apples and onions to still have a crispness to them when you serve. Other optional add-in’s: nutritional yeast, truffle oil, cayenne, cubes of butternut squash or sweet potato.